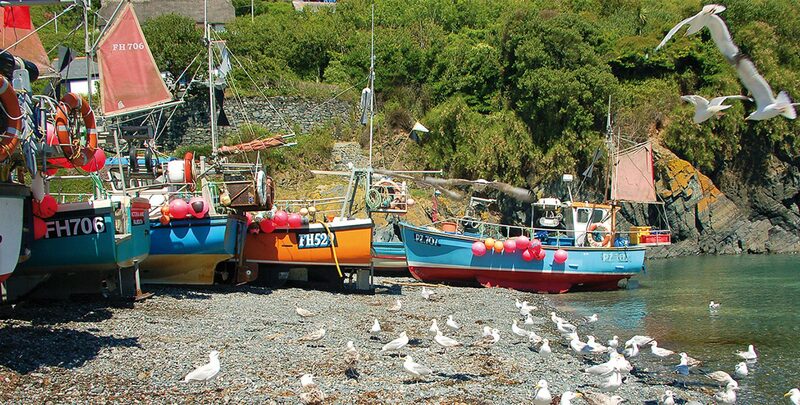 Fishing boats have been working out of Cadgwith cove for centuries, and if you stand on the beach, with its jumble of bait boxes, crab pots, nets and buoys, you'll feel you've left the modern world behind. The cove is hemmed in by eighteenth-century pilchard cellars and net lofts, and a winch house still in use today. The Cadgwith boats put out to sea daily - from April to December potting for crab and lobster, and netting for monkfish, mullet, ling, cod and pollock all year round. The cove has appeared on TV and in many films, including Ladies in Lavender and The Fisherman's Apprentice. Cottages cluster along the wooded valley; many are at least 300 years old, some are thatched, most have wonderful sea views, and a few have smugglers' hidey-holes! The lifeboat house is home to the gig club, the customs lock-up is now a gift and ice cream shop, and the Old Cellars restaurant is a former pilchard works. Just inland is Ruan Minor, with its post office and Village Store, farm shop, weekly markets at the village hall, a recreation field and a tennis court. Close by is the hamlet of St Ruan. 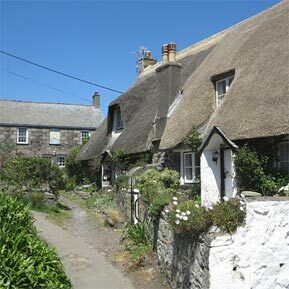 Both are only 10 minutes' walk from Cadgwith and many visitors prefer to stay here as cottages are cheaper, and quieter. Just three miles from Cadgwith along the stunning South West Coast Path is Lizard Point, the wave-lashed southern tip of mainland Britain, with its lighthouse standing guard over the busy shipping lanes. The Point has cafés and workshops selling ornaments made from the unusual local serpentine stone, and you may spot seals in the surf and rare Cornish choughs nesting on the cliffs. 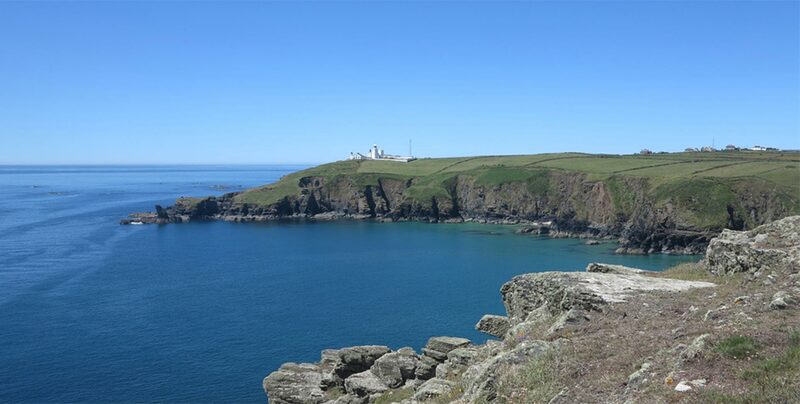 Visit the Lighthouse Heritage Centre to climb the tower, and call in at the Lizard Wireless Station, where Marconi received his record-breaking signal in 1901. Lizard village is a walker's paradise, with paths leading to the cliffs in all directions. Around the green are cafés, pubs and a pasty shop for well-earned refreshments, as well as gift shops and art galleries. Nearby is the pretty tucked-away inlet of Church Cove, with its well-preserved pilchard cellars, the RNLI lifeboat station at Kilcobben Cove and the Bass Pointcoastwatch station. 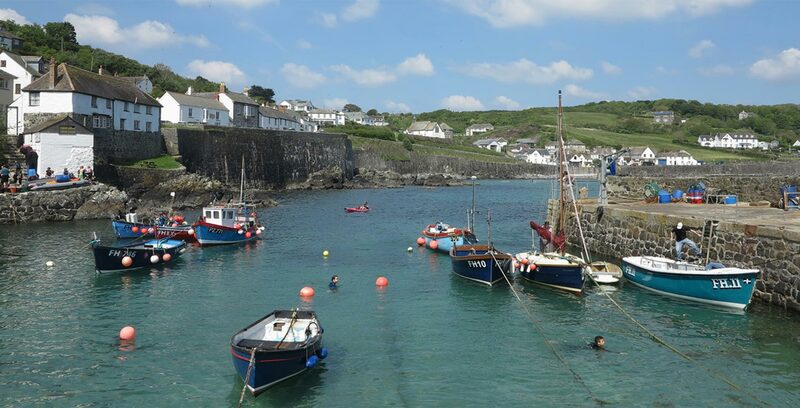 Cadgwith has two coves of sand and pebbles, ideal for swimming, kayaking and snorkelling. 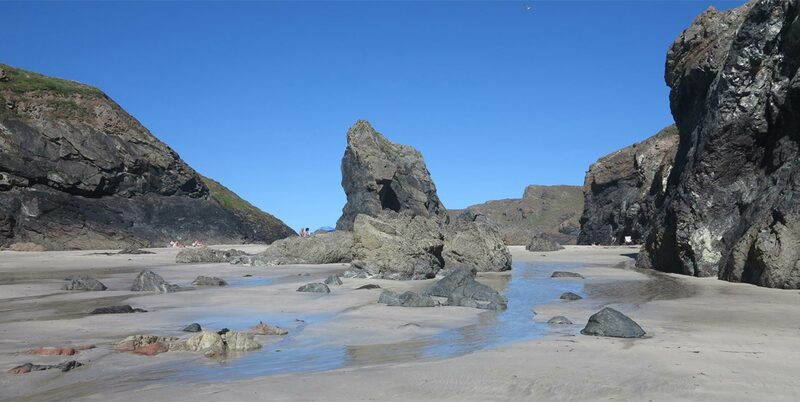 Kennack Sands is a popular family beach with cafés, summer lifeguards and a dog-friendly area, while the secretive caves and dramatic serpentine cliffs of Kynance Cove make it one of the most spectacular beaches in the West Country. The beautiful and secluded sandy Housel Bay is just a short climb down from the coast path. And there are even more beaches elsewhere on the peninsula . Bounded on three sides by the sea, and in the north by the ancient oak woodland and sheltered waters of the Helford River, the Lizard Peninsula is almost an island, removed from the hustle and bustle of the mainland. Quiet fishing communities are tucked into cliff clefts and valleys, whilst inland pretty rural villages are dotted amongst the rolling farmland and windswept heath. East from Cadgwith, across the glorious heather-clad expanse of GoonhillyDowns, lie Coverack and St Keverne. 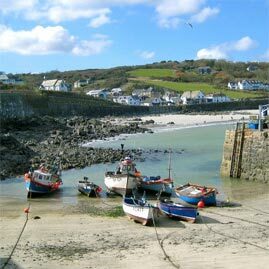 At Coverack, thatched whitewashed cottages cluster around the tiny harbour. There are excellent food and souvenir shops, and plenty of places to eat, including the old lifeboat house and the Paris Hotel, named after the liner wrecked on the nearby Manacle Rocks. The wide crescent of Coverack's sandy beach is ideal for swimming, snorkelling, diving and windsurfing, and there are exhilarating coast path hikes which will literally take your breath away. A short drive away - or an hour's ramble along the coast - is historic St Keverne, birthplace of two Cornish uprisings. Grocery stores, pubs and cottages are gathered around the village square, the tombstones of shipwrecked sailors crowd the parish churchyard, and an ancient cannon stands guard beside the lych-gate. On the village outskirts is Roskilly's, where you'll spend hours exploring the farm trails, duck ponds and calf sheds. The east coast of the Lizard is a maze of winding country lanes with quaint hamlets and ancient farms around every corner. On the coast, the communities of Porthoustock and Porthallow are former pilchard fishing coves with pebble beaches; Porthallow boasts a pub, the Five Pilchards, which is an Aladdin's cave of model ships and maritime memorabilia. You'll find other welcoming pubs at Newtown, Mawgan and on the waterfront at Helford, where the terrace overlooks the moored yachts and crabbers. The tidal waters of the Helford River, home to herons, curlews and kingfishers, flow up to Gweek and its large boatyard at the head of the creek. The village is a pleasant backwater with shops, a pub and the National Seal Sanctuary, where you can watch seal welfare in action. North from Kynance Cove is Mullion Cove, another former pilchard fishing inlet. Mullion itself, a mile inland, is busy with grocery stores, gift shops and galleries, pubs and restaurants. The sandy family beaches of Polurrian and Poldhu are close by, and past the scenic links of Mullion Golf Course, you'll discover the medieval hamlet of Cury. At the gateway to the peninsula, and famous for its May Flora Day festival when children and adults dance down the streets, Helston is an ancient market town and the closest shopping centre to the Lizard. Its Flambards Experience offers theme park rides and indoor exhibitions. If you've been swept up in the compelling new BBC adaptation of the Poldark Saga, you can follow in its brooding hero's footsteps and visit many of the locations which feature in the series. Gunwalloe Church Cove was the setting for a moon-lit wrecking scene. Spectacular Kynance Cove provides a dramatic backdrop in series two, and the iconic Botallack mine engine houses are less than an hour's drive away. You might also recognise the wave-battered harbour of Mullion Cove and Dr Dwight Enys' clifftop cottage at Gunwalloe Fishing Cove.